There are few people who have lived Life on their own terms, who have been brutally honest about themselves, as they have been of others, and who will live on through their Life’s message. Khushwant Singh was one of them. I know there are far too many obits, tributes and memoirs out there celebrating the grand ‘ol man of India – his Life and his times. One more from me may hardly seem to matter and it may even appear to be an overkill. But let me share what I have learned from him. 26 years back, my wife and I met Khushwant Singh. My wife lived in New Delhi at that time and we were to marry the following year. I was visiting her on a vacation. We had some time to kill one afternoon. We looked up the phone directory (well, there was once a time we all depended on that big, fat book!) and called Khushwant Singh’s home. He answered the phone himself. I introduced myself as a journalist from ‘The Indian Express’, Madras, and I asked if I could interview him for our weekend magazine. He gave me an appointment the next day. So my wife and I landed up at his Sujan Singh Park residence. He answered the door himself, was very cordial and offered us ‘chai’(it was around 4 pm in the afternoon, so Scotch was out of the question I guess). Although he may not have been expecting someone with me, he was extremely nice to my wife. When he heard that we were engaged to be married he said, “Companionship is very important in Life. Be happy with each other’s presence and be there for each other.”He must have been 73 or so. And I was just getting to be 21. That advice, unsolicited though it was, has stayed with me, and with my wife, all these years, and has served us both very, very well. That’s the first Life lesson I learned from Khushwant Singh – and wasn’t I blessed to have learned it live, directly from him? It was a good interview he gave me – he spoke about writing, shared his own views on the writer’s block and about journalism in India. He was very down-to-earth, dressed in home clothes with an unkempt turban on his head. Honestly, I was too overawed to be in his home, in front of him, that none of what he said really mattered to me then. I was keen on staying on for as long as we could because I wanted bragging rights that we spent so much time at Khushwant Singh’s home. So I kept on asking him questions. He soon got bored. But he did not hide his feelings or drop hints suggesting that we must now leave. He simply came to the point. “I am afraid you are taking more than the hour I had set aside for this interview. You have to excuse me. You will have to leave now,” he said in the most honest way anyone can say such a thing to visitors without sounding rude. We quickly apologized, packed up and left. That was the second lesson I learned from him – Be direct, in-the-face and truthful about whatever you feel. He surely lived his Life that way, but for young 20-something me, it was a big learning. I did not put this learning into practice effectively until about a decade ago. But ever since I have started being in-the-face and speaking my mind to people, I have been a lot more at peace with myself. Much fanfare has been made about how Khushwant Singh wanted his epitaph to read: “Here lies one who spared neither man nor God; Waste not your tears on him, he was a sod; Writing nasty things he regarded as great fun; Thank the Lord he is dead, this son of a gun.” But typical to the man, not too many people have known (even I would not have known had it not been for former India cricket captain Bishen Singh Bedi’s passing mention in his piece in The Hinduthis morning) that as per his will, Khushwant Singh’s eyes were donated before he was cremated yesterday. 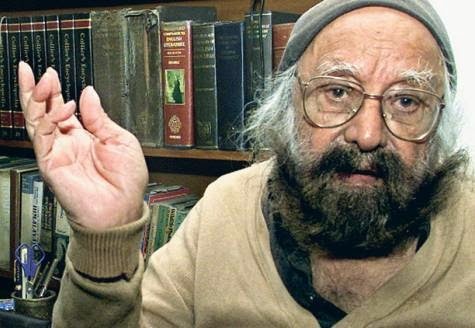 Through this compassionate wish of his, I learned yet another significant lesson from Khushwant Singh, albeit through his passing – Always, be useful! What a way to live and what a way to go. If we can imbibe the spirit of his Life’s message, we will all live happier – and peaceful – lives!